Mad Max is a 1979 Australian near-future action movie and crime thriller from director George Miller and starring a young Mel Gibson. 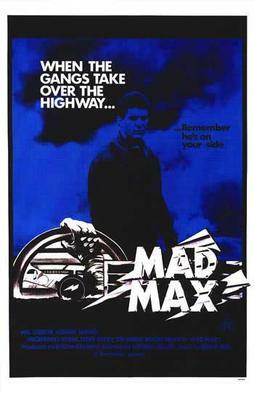 Mad Max was the first movie in what is, to date, a four-film franchise. This movie's story was originally conceived by the film's director (George Miller) and producer (Byron Kennedy). Mad Max focuses on an Australian police officer who must eventually avenge the lives of his wife and toddler son and also the cop who was his partner. Mad Max opens in a dystopian future that takes place “a few years from now.” The roads of Australia are plagued by motorcycle gangs and other high-speed drivers. Trying to keep the roads safe are the police officers of the MFP – Main Force Patrol – who pursue reckless road criminals. The top pursuit-man is Max Rockatansky (Mel Gibson). Max has an encounter with a gang member known as the “Nightrider” (Vincent Gil), in which Nightrider is killed. The vicious and cruel Toecutter (Hugh Keays-Byrne) leads “The Acolytes,” Nightrider's motorcycle gang, and the gang seeks payback against the MFP. Their actions against Max's family and colleagues sets Max on a mission of vengeance against Toecutter. In his supercharged Police Special, Max goes on hot pursuit with killing on his mind. Mad Max is one of those rare films that has the misfortune living in the shadow of a better-known and more popular sequel. 1981's Mad Max 2 (known in the United States simply as The Road Warrior) was a huge hit when it was originally released in the U.S. in 1982. The second film had an influence on American pop culture and references from and homages to the film continue to appear decades after its initial release. Still, the first Mad Max remains both a unique and an exceptional film. It is also darn-good fun to watch, and I wish that at least one of the Mad Max sequels was more like it. Max Max seems to blend 1950s Film-Noir crime films (especially those about street cops) and 1970s action-movies about cars and motorcycles with the kind of dystopian science fiction films that defined the 1970s. The result is a fast and efficient film with power that belies its size. Mad Max is cool without being slick and pretty. It is one of the few science fiction films that are entirely plausible or close to it. Mad Max is also timeless, although its future scenario originally took place only “a few years” from 1979. Director George Miller has apparently stated that the filming of Mad Max was unpleasant for him. From his suffering came cinematic art, and a movie star was born. Yes, Mad Max introduced the world to Mel Gibson, who would go on to be a fine actor, a worldwide movie star, and an award-winning filmmaker before his public behavior and private comments seemed to derail his career (at least as of this writing). Before that however, the legend of Mad Max carried us deep into the Outback, and we were in the passenger seat with rising star.